In history, I personally haven’t felt a sense of “newness”or “momentum” at this time of year but 2019 has ushered in some STRONG feelings of growth for me personally and professionally. It’s uncomfortable and to be honest frightening; So much so that I’ve tried to talk myself out of it. There’s a safety in staying comfortable and small, no? But all signs point to growth. So here I am stewing in the discomfort of growing pains. When I brainstorm themes for the ritual pedicure I think of themes that match the season in which they fall so I thought “momentum” was appropriate for January as it is conventionally associated with moving forward but I had my doubts because I felt it sounded a bit cliché. My feelings changed when Amelie, the energetic rebalancer I collaborate with for our Ritual Pedicures, sent me her write up about the stone she chose for the momentum theme. It couldn’t be more perfect for what I’m experiencing this new year and I hope it will provide some support for your endeavours as well. I wish each and every one of you a 2019 filled with growth and expansion and thank you from the bottom of my grateful heart for your support in the growth of Wildflower. Pietersite, the perfect stone for the beginning of a new year. 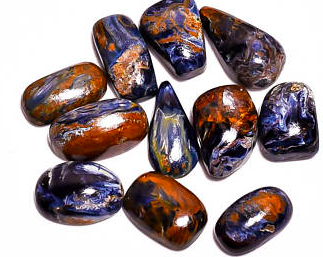 Pietersite helps you create change in your life by first helping you to connect with your spirit and the power of your imagination to dream and create beautiful visions and ideals for your life. It then helps you to let go of unwanted habits by increasing your willpower and helps you to take action. Hold this stone in the palm of your hand while you soak in a warm and comforting coconut milk infused foot bath. Frankincense and orange essential oil: Thought of as a spiritual essential oil, frankincense offers protection, fortitude, courage and resolution. It increases introspection, spiritual awareness and inspiration. Orange essential oil is known to be energetically purifying and uplifting, it boosts creativity, increases focus and calms the spirit. Inhale the scent of these essential oils under a warm facial compress. Lotus Wei’s Game changer flower essence: A blend of giant spider lily, date palm flower, banana blossom and pink primrose. This transformative blend of flower essences created by Lotus Wei invites effortlessness, simplicity and lighthearted action while inspiring rapid growth, creativity and spaciousness. Call us or book online at https://www.vagaro.com/wildflowerbautybar to experience the Ritual Pedicure. Our Ritual Pedicures are designed in collaboration with Amelie St. Pierre of Liberate Your True Self. Visit her at liberateyourtrueself.com for more info on crystals and energy rebalancing.